A 999 cc, quick revving, naturally-aspirated, parallel twin, powers the Talon 1000X — this isn’t Honda’s only 999 cc engine; it builds on years of experience with the Pioneer 1000 and CRF1000L (Africa Twin). 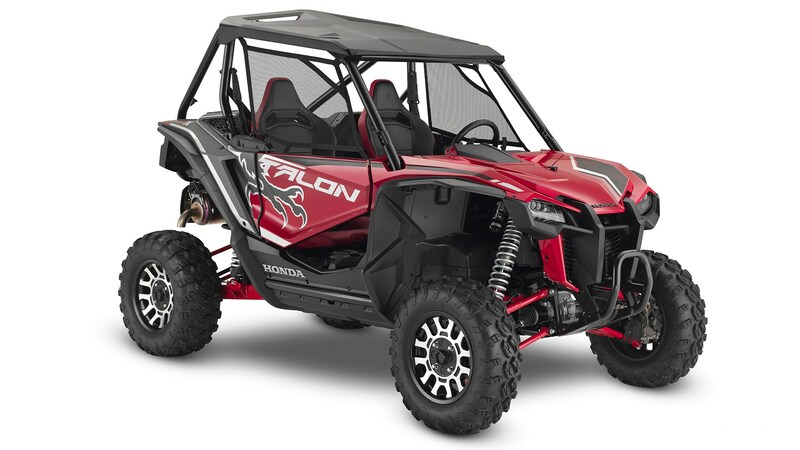 Here, it’s been updated, refined and tuned to provide increased performance while maintaining Honda engine durability; essentially purpose-built for the Talon 1000X. Engineers have adopted the Unicam head design with its low-friction roller rocker arms from the CRF motocross bikes, and have tuned the exhaust to create a sound like no other – especially when it’s at full throttle. Connected to the 999 cc engine is a fully-automatic six-speed Dual-Clutch Transmission. The transmission’s computer uses throttle position and input, RPMs, speed and brake input, to determine what kind of driving you’re doing, for instance if you are an "aggressive-style driver" it adjusts accordingly the engine character to be more exciting and powerful by increasing engine RPM for shifting up and down. Steering wheel-mounted paddle shifters can override the automatic transmission, to gear up or down, and then seamlessly drop back into fully automatic mode. The Talon 1000X also offers full Manual mode giving complete control over shift points and gear selection. In a low throttle or relaxed ride situation the Talon 1000X shifts smoother at lower RPMs for quiet operation. In a more aggressive riding situation, you’ll experience quicker shifts at higher RPMs to maximize torque and power. 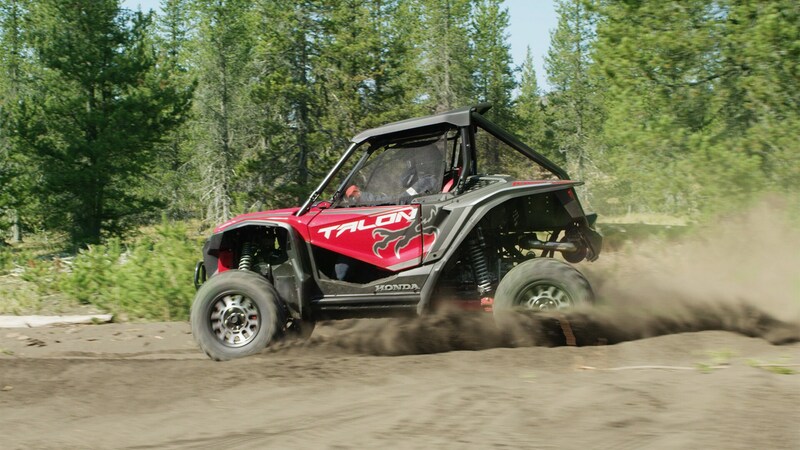 Talon is the industry’s first sport side-by-side to offer a gear-driven transmission with a high and low-range. For challenging terrain, drivers can choose between two traction settings. The Low Range Mode reduces the transmission’s gear ratio through a sub-transmission like a four-wheel drive truck. The transmission still shifts through all six gears, giving maximum engine torque and braking for hills and technical terrain. 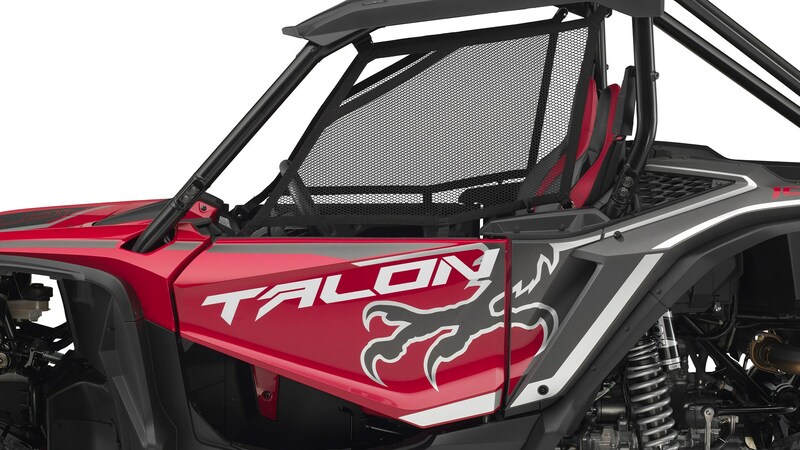 The Talon 1000X includes a suite of stability assist features designed to make your ride safer, easier and more fun. Using technology developed for cars and trucks, I-4WD includes Brake Traction Control System (BTCS) and Electronic Brakeforce Distribution (EBD). When I-4WD is engaged using the dashboard-mounted switch, BTCS applies additional drive to the tire with more grip, providing better traction. Getting going when you’re stopped on a hill can be a bit of an adventure. That’s why the Talon 1000X comes standard with Hill Start Assist (HSA). 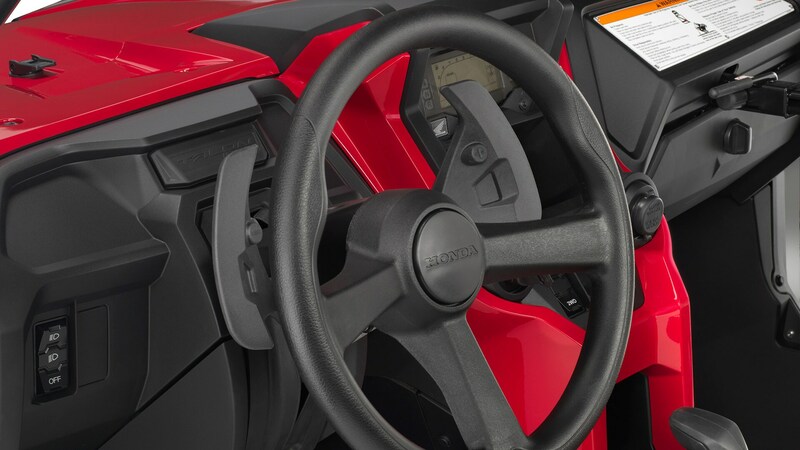 Activated with a dashmounted switch, HSA automatically maintains sufficient brake pressure so you can move your foot to the gas pedal and you’re under way. No more need to two-foot it or heel-and-toe shifting when conquering steep hills - meaning no rollback. 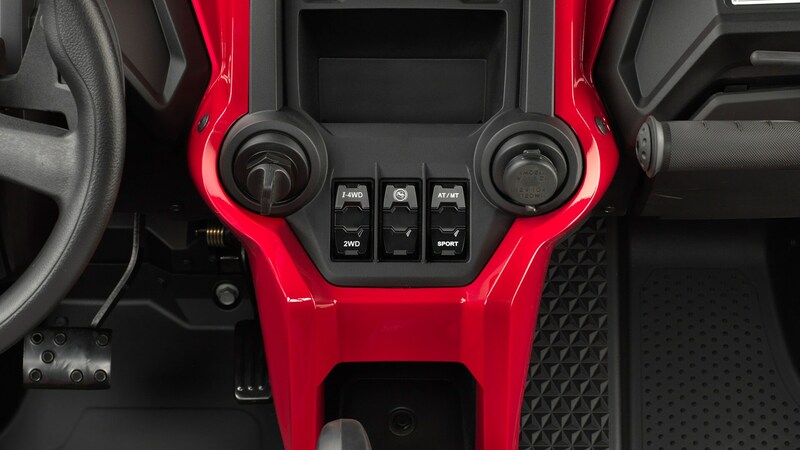 Independent front and rear suspension systems—double A-arm in the front, three-link trailing arm in the back—feature Fox Podium 2.0 QS3 (Quick Switch - 3 position) shocks with velocity-sensitive damping and remote reservoirs for superior control and heat dissipation during hard riding. 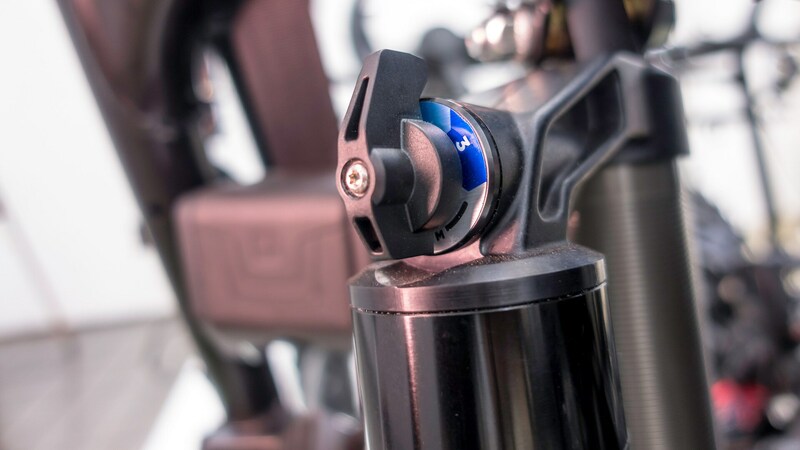 Unlike many other adjustable suspensions, which require counting dozens of clicks on each damper, Talon X's premium FOX QS3 system (specially designed for the Talon 1000X chassis), is as simple as adjusting the dial to one of the three settings that cover a broad range of terrain. Comfortable cruising... General sport ... Agressive, or fully-loaded driving. With 371/384 mm (14.6/15.1 in.) of front/rear suspension travel, and 323 mm (12.7 in.) 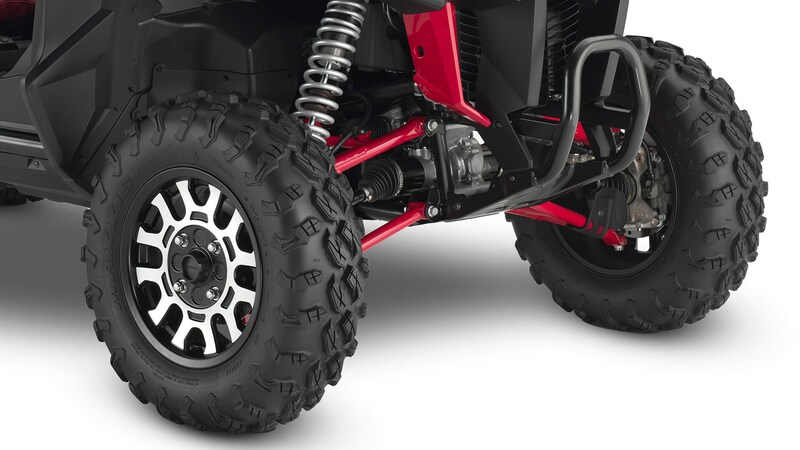 of ground clearance, the Talon X works great everywhere especially on tighter trails. Honda’s automotive-style Electric Power Steering lessens steering effort and helps eliminate bump steer, especially over rocks, logs and on sidehills. This speed and input force-sensing power steering system is tuned specifically for sport usage. Mounted on cast aluminum wheels the aggressive Maxxis tires—28 x 9-15 front; 28 x 11-15 rear—grab hard on any surface. They were tuned by Honda and Maxxis experts to optimize comfort and handling performance. To ensure exceptional rigidity, the Talon's square-tube frame is built as one piece that is designed to perform and is incredibly durable. The frames undergo a two-step process to maximize their durability. First, they are fully dipped in an electrostatic application process for full coverage inside and out. next the frames are powder coated. This two-step process is designed to prevent corrosion and chipping. 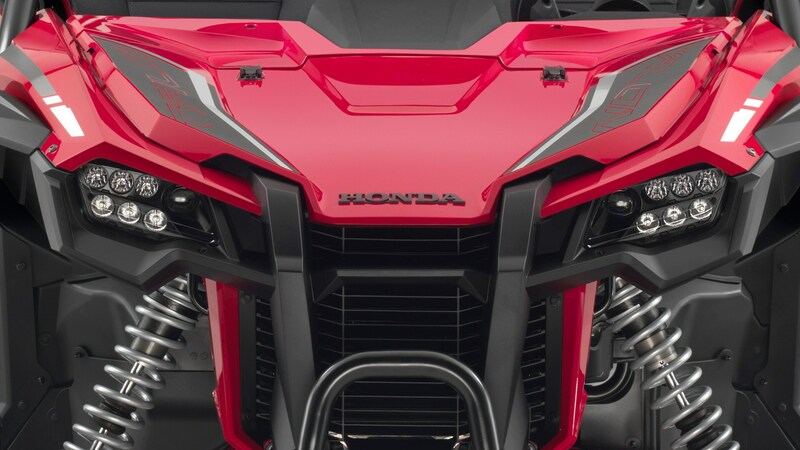 The one-piece roof section (with injection-moulded top) is designed with a built-in water gutter system that channels water away from the cabin to help keep the riders dry. 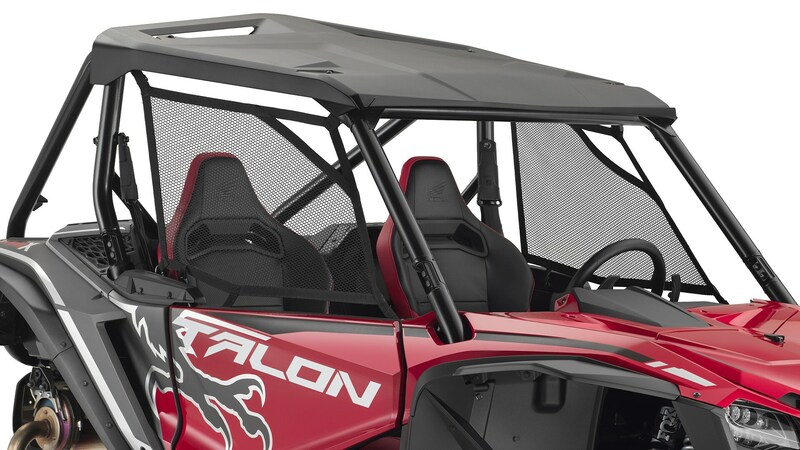 Also, the roof air vents are designed so the Talon 1000x can be transported facing in either direction on an open trailer. 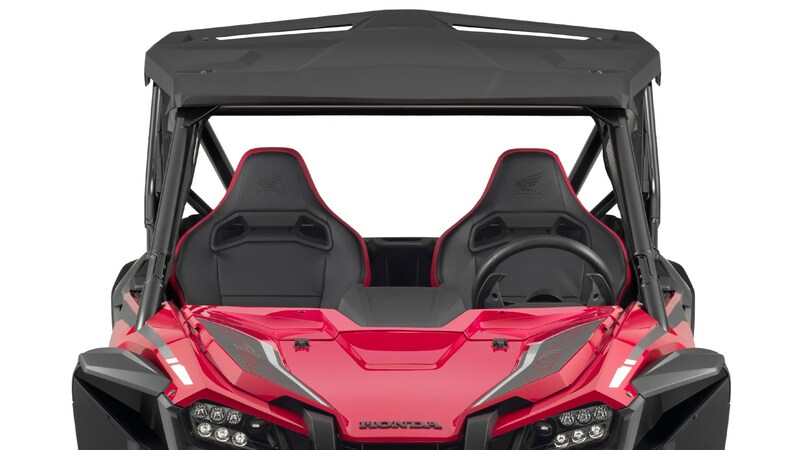 The Talon 1000X offers the comfort, safety and support of deep bucket seats. These large and roomy bucket seats are made of soft, thick foam that allows for comfortable all-day adventures. With their aggressive bolstering, the seats really keep the riders in place with the seat belts featuring an over the shoulder fit to confidently secure the driver and passenger while maintaining comfort. They also feature pass-throughs to allow for the use of a 4-point harness system. 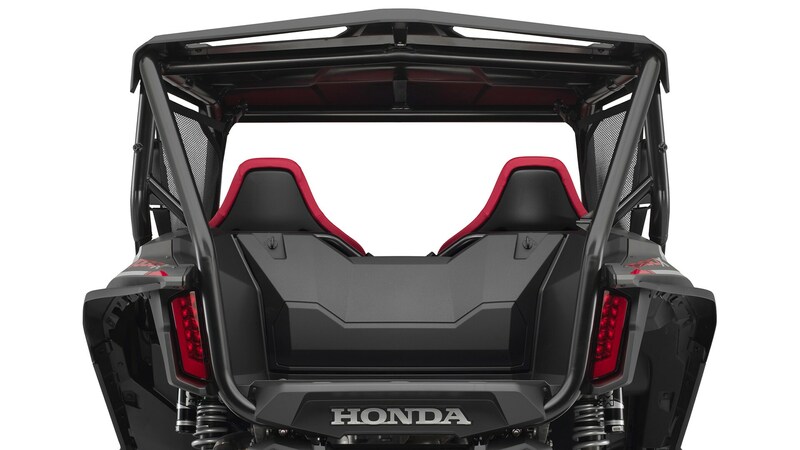 The drivers seat features a robust automotive grade adjuster, allowing the driver to be in the perfect driving position – The Honda Talon's interior design and ergonomics set it apart from the competition. It is specifically focused on providing the driver and passenger with the ultimate in confidence, comfort and convenience. 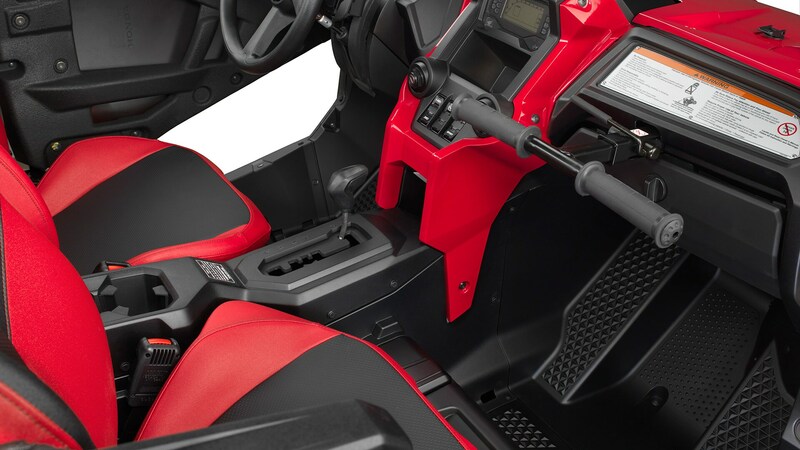 The Honda Talon 1000X also offers a variety of ergonomic features to ensure comfort for all riders. The steering column is equipped with a broad tilt range for comfortable arm positioning. It also tilts far forward for easy entry and exit. Hard doors with window netting specifically designed for sport driving, which can be eaily raised or lowered with just one-handed operation. The convenient passenger grab handle helps passengers feel more secure while enjoying the ride. The handle also features a “quick adjust” mechanism, which allows you to adjust and lock it into virtually any position with an unique cam-lock system, meaning that there’s no play… so no rattle, or vibration. Also the passenger floor has a raised area on each side to provide secure footing. Super-bright LED headlights with a Low and High beam provide excellent lighting performance for maximum visibility at night. From every angle, dynamic lines highlight its aggressive stance. Offering a completely new design, the Talon 1000X takes many style cues from the Honda CRF dirt bike lineup. The Talon 1000X borrows that flowing, high-bodyline look with fully-painted continuous bodywork to provide a high-quality, performance inspired appearance. Got stuff to carry? The Talon’s rear cargo area is large enough to secure a full-size cooler and other traveling accessories. In fact, it can hold up to 136 kg (300 lb). 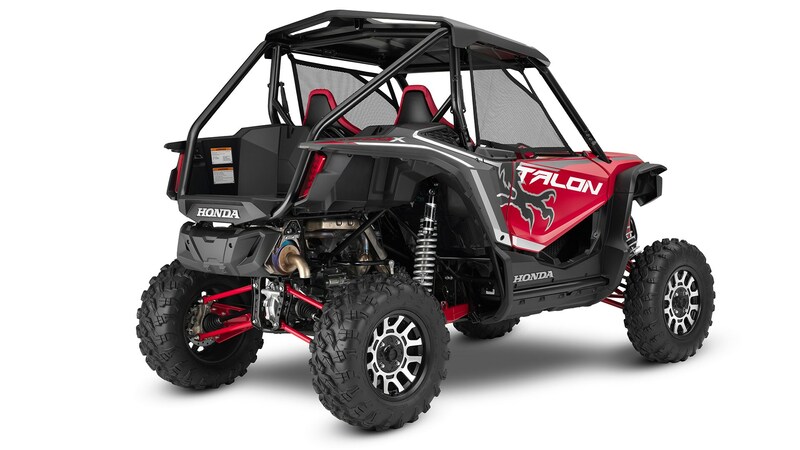 Make the Talon 1000X your own with a host of accessories including various roofs, cabs, covers, winches, body protection, lighting, storage, and cargo options. All of these accessories were specifically designed to "Enhance the Experience".